From diplomas to the Student Union seal, the Pegasus symbol has represented UCF for 50 years. But there’s another special place the winged horse can be seen — on the right hand of President John C. Hitt. 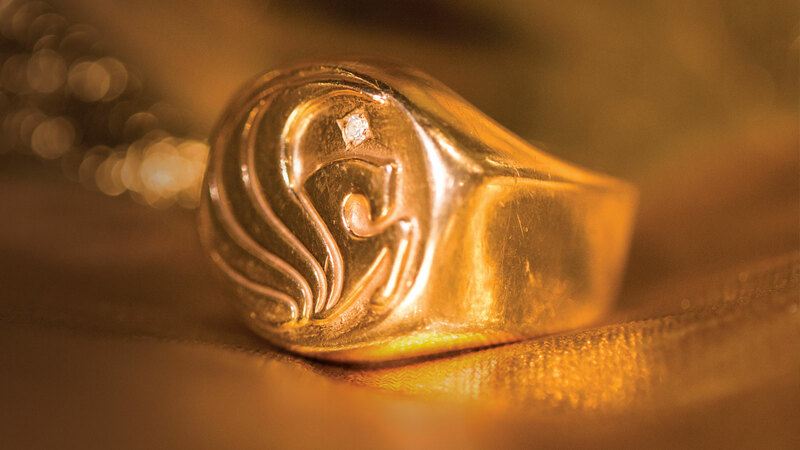 More than 15 years ago, Hitt came up with the idea for the Pegasus ring while brainstorming ways to honor people who have greatly demonstrated their loyalty to the university. Made of 14-karat gold, the ring features Pegasus, which has been UCF’s official seal since the university’s first president Charles Millican introduced it on April 5, 1968. The diamond represents UCF’s motto of “Reach for the Stars.” “We’ve tried to have the ring be something people would want and would be motivated to achieve,” Hitt says. Wilson designed the ring’s unique mold from a simple JPEG, transforming the Pegasus seal into a golden 3-D masterpiece. “Bill [Wilson] did a lot of work where he produced a copy of a fish or a little crab, and it was remarkably good work, so we asked if he might be interested in doing this, [and] he thought it was kind of a fun idea,” Hitt says. Thanks to a trusted routine, Hitt has never lost the ring. He puts it on every morning, and every evening when he gets home from work, he returns it to his dresser for safekeeping. “Certainly, the ring is the most precious piece of jewelry that I own — other than my wedding band,” he says.